Some people wanted to compare machines, so here is the exact code I used and some sample values I got from running it on my laptop. I'm curious what values other people get. ;;; This is code for MIT/GNU Scheme. We attempt to measure the speed of ASSQ. ;;; measure the speed of function calling. ;; Inline the standard scheme primitives. ;; data structure to this list. ;;; perform n-lookups on it. Specialized to fixnum-only arithmetic. Here's a sample run on my laptop. We make an alist with 10 elements and call ASSQ 100,000,000 times on it, fetching each entry about the same number of times. Process time is reported in milliseconds, so it took about 2.26 seconds to do 100,000,000 million lookups. This divides out to .0000000225 seconds = 22.5 nanoseconds per lookup. It should be about linear with the size of the list, so we'd expect a 100 element list to take somewhere around 225 nanoseconds. An alist is a simple data structure that holds key-value pairs in a linked list. When a key is looked up, the list is searched to find it. The time it takes is proportional to the length of the list, or the number of entries. A hash-table is a more complex data structure that holds key-value pairs in a set of "hash buckets". When a key is looked up, it is first "hashed" to find the correct bucket, then that bucket is searched for the entry. The time it takes depends on a number of things, the hash algorithm, the number of buckets, the number of entries in the bucket, etc. A hash-table can be faster than an alist because the hashing step is quick and the subsequent search step will have very few entries to search. In theory, an alist takes time proportional to the number of entries, but a hash-table takes constant time independent of the number of entries. Let's find out if this is true for MIT/GNU Scheme. A tree data structure is slightly more complex than an alist, but simpler than a hash table. 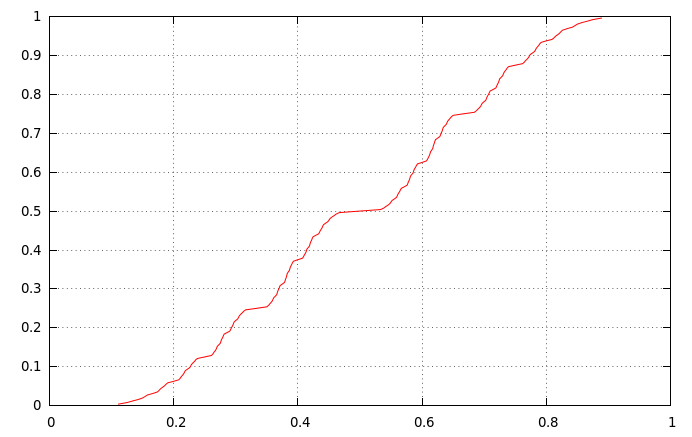 Looking up an entry in a tree takes time proportional to the logarithm of the number of entries. 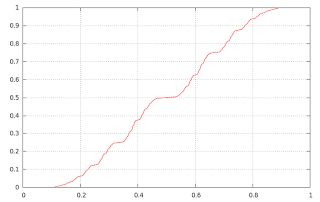 The logarithm function grows quite slowly, so a tree performs pretty well over a very large range of entries. A tree is slower than an alist until you have about 15 entries. At this point, the linear search of an alist cannot compete with the logarithmic search of a tree. The time it takes to search a tree grows, but quite slowly. It takes more than 100 entries before a tree becomes as slow as a hash table. With a big enough tree, the growth is so slow that you can pretend it is constant. (jmp (@pcr loop-3))          ;; Do it again. On my laptop, each iteration of this loop takes a few nanoseconds. I noticed that there seems to be a lot more going on than CDRing down a list. The interrupt check is responsible for a lot of the overhead. MIT/GNU Scheme polls for interrupts. The compiler inserts an interrupt check at every procedure entry and backwards branch. This ensures that only a small, bounded number of instructions can run between interrupt polls. The interrupt poll and the heap check are simultaneous because of a hack. To interrupt Scheme, you save the "Top of Heap" pointer and set it to zero. This causes the heap check to fail as if there were an out of memory condition. The out of memory handler first checks to see if this was actually an interrupt masquerading as an out of memory, and restores the heap pointer if so. perform the check. The first compares register 7 with the contents of memory that register 6 points at. The convention for the compiler is that register 7 contains the free pointer and register 6 holds the address of MEMTOP. The interrupt check does a memory cycle. at an interrupt. Interrupts are polled at apply time. Before application, the interrupts are checked. If an interrupt is to be processed, a continuation is pushed that will do the original application, and an interrupt handler is applied instead. loads register 0 with the contents of memory at register 4. (The compiler convention is that register 4 is the stack pointer.) In other words, it is fetching the value of the argument tail from the stack. This is the second memory cycle. Between interrupt polls, the compiled code can freely manipulate Scheme objects without worrying about being embarrassed by the garbage collector. But at apply time, when a possible interrupt poll could happen, the compiled code must put the virtual machine back into a coherent state. In particular, modified values are stored back on the stack.I This instruction just before the jump puts the value of tail back on the stack before jumping to the top of the loop. Of course these are quite inexpensive memory cycles because the top of stack is cached, but there is at least the time time it takes to validate the cache entry. (cmp b (r 1) (&u 1))           ;; Check for pair? (cmp b (r 0) (&u 1))           ;; Check for pair? If I count correctly, there are six memory cycles per iteration, two of which are CDRs. We also avoid a single jmp instruction per iteration. 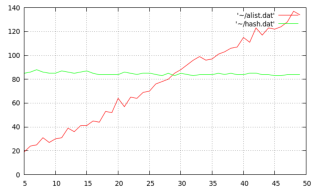 But after garbage collection, the performance dropped a bit. Now it's taking 4.49 ms.
All the cons cells are on different pages. You can see that the cons-cells addresses are next to each other. In an earlier post, I asked readers to implement the bijection rational->integer and integer->rational. John Cowan suggested the Calkin-Wilf tree as a starting point. The Calkin-Wilf tree is a rooted binary tree where the nodes (or vertices, if you like) are labeled with positive rational numbers. It is infinite and complete: every node has two children. The Calkin-Wilf tree is constructed so that every rational number is assigned a unique node. Every positive rational number appears once and exactly once in the tree. The path from the root node to any selected rational is unique and can be encoded (in binary) as an integer. Ho hum. We've all seen this sort of thing before. The dyadic fractions are those rational numbers whose denominator is a power of 2. Numbers like 1/4, 3/8, or 11/32. These are the divisions you'd find on a ruler (in the US). Floating point numbers are usually implemented as dyadic fractions. The next question is, what happens if I use a path derived from the Calkin-Wilf tree and use it on the dyadic fraction tree? Yes, this is a fairly random thing to try, but the trees are the same (that is, have the same structure) even if the values at the nodes are not. Either set of fractions is in a one-to-one mapping with the tree, so there is a one-to-one mapping between rational numbers and dyadic fractions. This is Minkowski's ? (question mark) function. It maps the rational numbers on the X axis to the dyadic fraction on the Y axis. It has a number of weird properties. For example, it is strictly increasing and continuous, but it is not absolutely continuous. The function does not have a derivative in the usual sense. This is in a high school math textbook in Texas. Example 2 : Is there a one-to-one and onto correspondence between integers and rational numbers? No matter how you arrange the sets, there is never one unique integer for each rational number. There is not a one-to-one and onto correspondence. The challenge: implement rational->integer that returns "one unique integer for each rational number", and its inverse, integer->rational. A friend of mine recently said to me "Don't know anything about currying except for food". I'm sure that nearly everyone who reads this blog is familiar with currying functions (and has probably curried a function within the last few hours), but it makes a good blog topic anyway. "Currying" a function (as opposed to an entrée) is named after Haskell Curry, but he was inspired by a paper by Moses Schönfinkel, and it appears that Gottlob Frege came up with idea. So much for the name. Pick your favorite binary function. I like "multiply", but any binary function will do. It need not be associative or commutative. As an example, imagine a print-to function that takes a document and a device. Note the similarity between make-multiply-by and make-print-to-device. We have a pile of functions, all similar because they were created with the make- function. And the make- functions are all similar because they were created with make-unary-maker. This is the meta-operation we call "currying". We take a function of several arguments, decide on some fixed values for some subset of arguments, and return a new function of the remaining, unfixed arguments. Captain Obvious has a few things to say about functions. A function won't return a value unless you call it. The cardinality of the set of return values cannot be larger than the cardinality of the set of valid arguments. Functions don't make up values. There can be fewer possible return values than possible valid arguments, but never more. If two sets are different sizes, then if you try to pair up elements from each set, you'll have some left over. If we compose two functions and the set of possible output from the first is different in size from the set of possible valid input to the second, then there will either be output from the first that the second cannot accept, or possible inputs to the second that the first cannot produce. The latter case isn't a problem, but in the former case, you'll get an error. If you "invert" a function, its output becomes input and vice versa. Since inverse functions (when they exist, that is) are functions, The same constraints on the cardinality of input and output apply, but in the other direction. If you invert a composition, then the valid arguments and results swap roles. If the cardinalities match, we're cool, but if there is a mismatch, we're in the opposite situation of the non-inverse, and what was not an error (i.e. accepting an input that can never be produced) becomes one (i.e. producing a value that cannot be accepted). If the appropriate cardinalities never increase, you can compose two functions. If the appropriate cardinalities match, you can invert the composition. What does this have to do with currying? I'm reading a bit about group theory and I chanced upon some exposition that was thick with comments and arguments surrounding the cardinality of various sets and subsets within the group. Once the exposition introduced a number of sets with equal cardinalities, the author pointed out that you can define an invertible function between any two sets with the same cardinality. Since the set of integers and the set of multiply-by- functions have the same cardinality, you could define a function that maps integers to multiply-by- functions. This isn't much of a revelation because that's what we did to get those functions in the first place. After slogging through this, I finally worked out what they were trying to say: "You can curry the binary operation." But they completely avoided the word "curry", and made arguments about set cardinality. The next paragraph in the exposition was worse. You can curry the other argument to the binary operation. This leads to a completely different set of curried functions over a different set of arguments. Now it ultimately doesn't matter which argument you curry, when all is said and done, both arguments show up and are passed to the binary function. But all the intermediate values are drawn from different sets than if you curried the other way. It takes a very complicated argument about cardinalities to derive that either way of currying will work.